In the second case he totally overlooks innovative and terrifically drinkable beers. Later he implies that Dogfish Head’s brewing style is less than disciplined — despite the fact the story documents Dogfish Head’s growing level of sophistication when it comes to quality control. I didn't really want this to be a critique of Dogfish Head, a brewery about which I know little. I've had four or five of their beers, and every time, I find the flavors muddy and indistinct. Given the large, extremely enthusiastic following, I always expect more. My real critique of the brewery is Sam's apparent lack of disciple, all of which I take directly from the article. Bilger consistently portrays him as a guy disinterested in learning theory or craft, but delighted by experimentation. The article begins with a story about how he recently ordered $150,000 of tropical wood to build a cask based on the advice of a customer. If this isn't seat-of-your-pants brewing, what is? Calagione's own head brewer is the one who characterizes him as undisciplined, not me. But the other thing here is that Dogfish Head seems to be credited with innovating things that have been around a long time. Their "continuous hopping" schtick is an example. Bilger describes how Calagione learned on a cooking show that some dishes are infused with spices while they simmer. So he invented a machine that sprinkles hops into his beer throughout the boil. But this is hardly innovation. For centuries brewers have hopped their beer throughout the boil. They may not have jury-rigged a machine to sprinkle them like rain, but then again, they weren't so inexperienced that they had to get the idea from a cooking show, either. The point is, there are a lot of breweries in this country doing exceptional brewing, and many that have been doing it for decades. Innovation may mark Dogfish Head's approach, but Dogfish Head isn't, in my view, the brewery that embodies the spirit of innovation in American brewing. And I don't think Burkhard Bilger realizes that. Friend (n) - One who agrees to buy you Abyss while you're out of town, traveling to several stores to track it down as supplies dwindle, and who does not lie to you about his success finding it deep in some suburb. Use: Deschutes released Abyss while I was in New England, but fortunately, my friend bought a couple bottles for me. The turning point came in 1999, when Calagione was watching a cooking show on television. The chef, who was making a soup, was saying that several grindings of pepper, added to the pot at different points, would give the dish more flavor than a single dose added at the beginning.... Later, when his kettle was boiling, he put hops in the bucket, perched his contraption at a slant above the kettle, and set the game vibrating. Soon, a steady stream of hops was falling through the bucket onto the playing field and sliding into the kettle. Well, as everyone in Oregon knows, the "extreme-beer experiment" was already well, well underway. Dogfish Head came to the party 20 years after it started. I have no particular beef with Dogfish Head, though I have yet to find a beer from the brewery I genuinely like or admire. But to suggest that this is the state of craft brewing is flatly wrong. Calagione has a cheerful pirate-like attitude about industrial breweries, and Bilger casts this as the posture of all craft brewers. One wouldn’t be blamed for thinking that his lack of discipline also characterizes the industry. But of course, in heavily-breweried regions, it’s the opposite. No breweries are founded in the Dogfish Head model now--at least not in regions of the country were there is any brewing presence. Like restaurants in big cities, when breweries open now, patrons expect excellence instantly. Drinkers won’t tolerate off-flavors, and they won’t reward pedestrian brewing. The days are gone when a guy who knows little about beer and less about brewing can found a successful brewery. No one is willing to endure years of bad beer while he learns his craft. New breweries now feature brewers who have apprenticed elsewhere and have years or decades of experience. A mention of this reality would have made the industry seem less half-assed. Bilger's fuzzy thesis is part "hey, look, someone other than Bud is making beer" and part "craft beer has been around awhile, but it's only now evolving into something interesting." The lines between these theses are not clear. In either case, they're both misplaced. Interesting stuff has been going on a lot longer than Dogfish Head has been around, and Dogfish Head isn't the best example of the interesting things going on. (Reading the article after visiting Allagash makes the point all the more clear.) This is one of the downsides of the New Yorker model, though--pick the wrong interesting character, and your story goes sideways. I am thankful that you all read the blog, which brings me enormous pleasure. And may we enjoy another year thanking our glorious Oregon breweries for making this Beervana. I am lodged in the hills of western Maine, not more than a few miles from the New Hampshire border. We have just enough elevation to be above the snow line, and I can see white pines and the ghostly white bark of denuded birch trees out the frosted window. (A palatte of many whites, some of them green.) The cabin is one of Sally's brother's, brand new, smelling of the pine beams that support it. Last night, a different brother arrived from Maryland bearing beers from across the east. I alert you to two. Hook and Ladder Brown is a beer I wish Oregonians brewed. The humble brown, so tasty, so warming, is so often overlooked. In Rochester, they brew it with Cascade hops, resulting in a comforting but lively beer you'd be happy to drink all night (one of Sally's brothers did, in fact). If you're on the East Coast, consider having a bottle. A more exotic beer comes from Clay Pipe Brewing--Backfin Pale. I cracked open a bottle and took a sniff--pilsner. I looked at the label, where it clearly says "pale ale." In fact, it's a pale hopped with Saaz, apparently late in the boil, because the aroma is pronounced, the flavor a little less so. Other, unidentifiable hops are used to bitter. I've often wondered why breweries don't use Saaz outside a fairly thin band of beers, and I was fascinated by the experiement. Slight cognitive dissonance, but one I enjoyed. I also had a Dogfish 60-minute IPA and confirmed, again, that I'm just not a fan. The flavors are overly rich while simultaneously indistinct. Give me an Inversion or Terminal Gravity any day of the week. I loaded some of the pics I've taken onto the computer. Enjoy. The "cool ship," or vessel used to spontaneously ferment Maine lambic. The door into the cool ship room. Allagash ages much of their beer in barrels, including that huge one at left. The Eaglebrook Brewpub in Norfolk, MA. Okay, I'm down with a cold, and a Nor'Easter's blowing through Maine. I'll be settling down to a nice winter's nap soon enough. However, I just had a delightful tour of the brewery, and over Allagash Tripel, discussed the lambic experiment with founder/owner/brewer Rob Tod and master brewer Jason Perkins. There is much there to tell, and I want to dole it out in lush detail, but just to keep you interested, here's an unexpected little fact: during their barrel-aging process, Allagash discovered a brettanomyces culture in one of their barrels a few years ago. Turns out it's a native culture, a Maine ride-along so to speak, and they had it isolated at Wyeast and it's now banked there. It has become one of their regular strains, used, for example in the exceptional Interlude, which I'll write about later. One of the things I've been keeping my eyes on is the pervasive use of shaker pints. So far, I'm three for three. I'm not measuring them, so I don't know how many ounces they contain--but recall, that's the problem. You just can't tell. Incidentally, although it's a little crude and non-informative, honestpintproject.org is live. It's really a placeholder for what will be a fuller site, and I'm calling this the "soft launch" phase. But have a look if you wish. This afternoon, en route to the other Portland (Sally, born there, accepts "Original Portland" but rejects "Fake Portland" and "Beta Portland"), we stopped off at the Westford Grille in Westford, MA. Lots of non-micros and then Guinness and a pale ale from local Berkshire Brewing. My sense is that it's the flagship, and it was pretty sub-par. A good pale ought to be sharp, crisp, and bright. Berkshire's by contrast was murky--flavors were muddled and there was a suspicious haze that made me think the pond-water quality wasn't just fun house character. Headed to Allagash tomorrow, where I should be able to do an interview with someone from the brewery. Central focus: the Allagash spontaneous fermentation project. More when it's available. Although six states comprise New England, it's just the size of North Dakota and is mostly about as intact culturally. Anyway, the subtleties that distinguish a Vermonter from a Mainer are fine enough that they're below this Oregonian's radar. The Red Sox are loved as dearly by citizens of Bangor and Burlington as Boston. In the wonderful old town centers that dot the countryside, you will find few McDonald's, fewer Starbucks, and generally none of the strip-mally blight that infect so many small towns in America. But you'll find a Dunkin Donuts in every wide spot in the road. New Englanders are mad for their Dunkin Donuts. Over the years of my visits here to see in-laws, I have begun to catalogue some of the idiosyncracies of the region. (All of this, incidentally, will lead to beer--doesn't everything?--so bear with me.) When you get something from the basement, for example, you're "going down celllar." Hamburger is "hamburg." The best coffee comes from the very rare Starbucks or the occasional independent coffee shop. But mostly people get coffee from the aforementioned Dunkin Donuts, which has inexplicably made coffee a cornerstone of their business. This goes back decades, apparently, though the coffee is akin to the old Farmers Brothers you used to find in Oregon diners. But in exchange for the bad coffee, New England offers certain delights--candlepin bowling, for example. According to the occasionally-reliable Wikipedia, it was invented in Worcester, Mass in 1880. Similar to regular bowling, but played with a grapefruit-sized ball and pins that are mostly cylindrical. You get three throws per frame, and the pins are not cleared in-between throws. It's substantially harder than regular bowling, even though the "deadwood" of fallen pins helps you clear out remaining pins (the highest score ever recorded was a 245). The beer, however, is familiar to the traveling Webfoot. When I arrived in Boston friday night, I was offered a Harpoon IPA--a beer that has to make no apologies to the West Coast for its rich, hoppy flavor. Last night we stopped in at the Eaglebrook Saloon in Norfolk, had a couple of quick pints while we waited for three pizzas to go. I'll do a round-up of pubs soon, but it's worth mentioning that Oregon's pub culture shares the same inspiration as New England's--Old England. New England just does it more convincingly. The Eaglebrook is this fantastic wood-paneled pub that feels like the inside of a ship. It may have been built in 1990, but it feels more like 1790 inside (if you ignore the several flat panels showing NESN--the region's ESPN). I'm about to head north of Boston to see the next in-law (we're trying to make as big a circuit as possible), and maybe there'll be a pub somewhere nearby. I'll keep you posted. At PDX, and I've never seen it this empty. The line to get checked in was literally four long, and the security line was about ten. And this is at seven--presumably the main time for travel. It was so dead that the woman in the security line joked that without my beard, I look nothing like my driver's licence (not true). I had a Redhook Double Black last night, which I was going to review as I waited for the plane. But it turns out their boarding now ... right on time. So it will be tonight. Mind the fort, will you? Very good beers share a single quality with very bad beers and with none in-between: you know instantly whether they're winners. It took only the length of time for the taste buds to deliver their message along neural pathways to my brain to make my judgment. 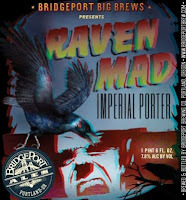 One sip of Raven mad and I knew it was a very good beer. It is now practically mandatory for breweries to release special high-gravity beers. It keeps the (all-powerful) bloggers happy and creates buzz for a brewery which (I presume they hope) reflects back onto the main product line. No brewery has been more agressive at pursuing serious beers than BridgePort, but so far, they have yet to score an Abyss-like home run. It's not for lack of creativity or imagination. Beginning with Supris a couple years back and continuing through this current run of their Big Beers, they've really been experimenting. Stumptown Tart was a total misfire. Hop Czar was respectable, but didn't hit Tricerahops heights. But with Raven Mad, what's the line? Right--three's a charm. It's easy to make a big beer that inspires awe, but a whole lot harder to make one that is instantly pleasurable. I tend to approach high-gravity monsters with caution--too often they bully my taste buds rather than impress them. It was with this caution that I approached BridgePort's latest, an imperial porter aged in both Jack Daniels and pinot barrels. For one thing, bourbon barrels have become a bit of a bane to brewing; they can swamp an otherwise fine beer with either harsh liquor notes or a cloying butterscotch sweetness. Or worse, both. Pinot barrels contribute less overt flavor, but wine is very tricky; in most examples I've tried, it has made the beer taste sweetly underfermented. Since it was these flaming torches BridgePort decided to juggle, I approached with even more caution. No worries. The first wash of flavor is so purely pleasureable you don't immediately pick up the layers of flavors. It's a creamy chocolate-vanilla rush to start with. You almost don't think to stop and swish it around. The second sip is where you pick up all the notes that contribute to the whole. The base beer is creamy and chocolatey, balanced with dark roasted malts more than hops. The bourbon is a bronzy patina, a note, not a symphony, riding on top of the porter. Behind the chocolate is a fruit note that must be grape but actually inclines more toward cherry. Raven Mad, like a good winter beer, warms in the mouth and keeps warming down into the stomach. I have no doubt that it will age beautifully and unpredictably. Which flavors will come forward and when? Have to put a few bottles in the cellar and see. Incidentally, the label is clever but slightly misleading. It's a cheesy 50s horror motif, done poorly in 3-D. They hook a pair of 3-D glasses on a bottle so you can see just how poorly the effect comes off. I assume that's intentional, too--fifties 3-D was mostly a gimmick. I cracked it not expecting such a sophisticated beer. It's one of the best barrel aged beers I've had, and an absolute must for porter and stout fiends. I would say it's no less a must-buy than Abyss. Definitely pick up a bottle or six while they're still available. Malt: "Humongous amount of chocolate malt and roasted barley"
Other: Aged in pinot and Jack Daniels casks. Availability: BridgePort only made 1,300 cases (15,600 bottles), and they released them a week before Halloween, so supplies are probably dwindling. InBev completed their takeover of Anheuser-Busch yesterday, and the new company will be called Anheuser-Busch InBev. InBev is the contraction of Interbrew and AmBev, the company's last purchase, and the current name lacks none of the poetry of the previous iterations. It is no less lovely than MillerCoors, the spawn begat by SABMiller and MolsonCoors. You know how I spent a great deal of time investigating the nature of the wet hop earlier this year, surmising that some of the constituents of the hop cone affect flavor in out-sized proportion when added wet to the boil? Well, based on two years of data collection and 15 beers with known hop varieties, I have discovered ... nothing. Well, not quite nothing. I lined up every hop used in these beers (9 of them) and looked to see which ones with the "decomposition note" had various constituent elements. I had really hopped to see a culprit--cohumulone or one of the oils, probably. But no. It's totally random. Five hops produced no decomp note--Amarillo, Cascade, Centennial, Crystal, and Nugget. The preponderance of the initial letter is about as close to a correlation as I could find among these. My new theory--it's the way the hops are used in brewing, not the hop itself, that produces the decomp note. Or something. In comments below, Green Dragon owner Ed Schwartz gives a thorough debrief of the final days of the pre-Rogue era. Yes it is true that I will no longer be the owner of the Green Dragon. While I am bummed out it didn’t work out with me as owner –I am grateful to Rogue for stepping in and doing the things that we could not. The city is requiring the building to be sprinkled, doors to be inset, walls to be built separating the brewery. They have additionally tacked on over 51k in CBC fees. Completing the brewery should take another 50k or so. The building has to be sprinkled by February in order to stay open. Lolo and I don’t have the resources to do this—the consequences being that everyone would lose their favorite watering hole, and several employees would lose their jobs…..which is why I began talking to Rogue. Viewing them as the enemy is silly—they are doing Portland and Green Dragon customers a favor by keeping this institution alive. I’d give them a break and see how things develop –their reasons for stepping in, as I understand it, are that they too fell in love with the Dragon and want to take what we started (19 rotating taps etc., meet the brewers nights, etc) and run with it. I think emotions run high due to our feelings for the Green Dragon. Mine certainly are as well. In my dealings with Rogue I have gotten a sense that their heart is in the right place on wanting to take care of the customers, employees (providing them with health insurance and matching 401k which I could not) and Founders Club – If anybody has questions about anything—I’ll be in this Tuesday for Meet the Brewer and would be glad to answer any specific questions then. A couple of Honest Pint Project updates. 1. The url honestpintproject.org should be live in the next week or two. It will be rudimentary to begin with, but hey, rudimentary is my style, right? 2. Tee-shirts will be available when the site launches. 3. Although I have to make a few confirmations, I believe that very soon a glass company will begin to produce a series of glasses etched with an "Honest Pint Project" seal and a line at 16 ounces. * I have been working with the company but am not in any way associated with the business side of things. Details and information for retailers when that becomes available. They just emailed out of the blue and said, "what do you think?" Um ... how does super-fantastic sound? *In December 2007, I established the Honest Pint Project. The intention of the project is to encourage public establishments to serve beer in glassware conspicuously marked or recognizably large enough to hold a full fluid pint (16 fluid ounces). I am the originator of the idea as well as the name “Honest Pint Project.” I am furthermore the originator of the concept of “honest pint” in connection to the concept of a glass containing a full 16 fluid ounces. Therefore, as the originator of the Honest Pint Project, I hereby establish my right of ownership of this mark. I assert ownership of the Honest Pint Project and its derivatives: the logo for the project, and the phrase “honest pint” as it pertains to this project. While I assert exclusive right to the use of “Honest Pint Project,” “Honest Pint,” and the logo, it is not my intention to restrict the use of these ideas when promoting products or services in accord with the intention of the project. However, I do assert my right to prevent restriction of the use of these ideas, names, and logos by other entities, partnerships, corporations, or people. This mark is available for free use by anyone using it to designate glassware conspicuously marked as containing 16 fluid ounces, or to promote establishments serving beer in conspicuously marked or recognizable glassware in accordance with the intentions of the Honest Pint Project. Angelo went to the Hair of the Dog dock sale and came away with fantastic pictures (including the requisite shot of a beer blogger in a Boston cap) and stories. One of those, "what if they held a beer sale and an improptu beer tasting of cellared beer from all over the world broke out?" deals. Looks like I missed a helluva time. Is there any doubt this is really a beer paradise? A brewery taking over a local bar might not make news in most towns, but in Portland, it's a Very Big Deal. Below are some early reactions. Keep reading, though, because Champagne of Blogs has a call for direct action--I'll note that at the end of the post. As a mug club member and big fan of the Green Dragon, this is quite depressing. I'm still hoping this doesn't come to fruition, but if this holds up the East side just had a major setback. I'll be honest, I don't like Rogue very much. Their beer is decent, a few are really good, but overall overpriced. They don't treat their employees very well, and the ones they do have often couldn't care less about knowing their product. Everything is overpriced in their pubs, so I'll stick to the bottles and maybe forking over the big chips to try something special if it is only on tap. I don’t have a particular beef against Rogue, I drink their beer, but there’s a reason I haven’t been to the Public House in Portland for years. The food is pretty spendy for the average quality and the beer list certainly lacks diversity. This falls on the heels of our past loss of Rose and Raindrop Pub which was another beer bar icon to the city. That was sold to banking company. Most people know that Ed had chosen another local brewer to take over the slowly-gestating brewing operation -- a friend of mine, as it happens. He hasn't been officially hired yet, so I'll be upset if the sale puts a stop to that. On the other hand, if he gets to become a Rogue brewer, that's a huge feather in his cap, not to mention an excellent catch by Rogue. So I'm looking on the bright side. Not put their crappy food on the menu. Maintain the EXCELLENT tap list, and not just fill the keg cooler with sub-par Rogue brews. Keep the amazingly knowledgeable wait staff. So, how can YOU join the movement that’s sweeping across Portland? Simple, join us on Facebook or leave a comment here. We’ll be sure to forward everything to Rogue. I would probably tweak that petition if it were me. I doubt Rogue regards it's menu as "crappy," so this may not be wholly persuasive. Nor do they regard their beers as "sub-par." Political action requires a bit of finesse. Twere I to have composed it, I might have said, "skip the usual pub fare and maintain a menu of eclectic, excellent food," and on point two just go with "maintain the excellent tap list by continuing to have a broad selection of beers from around the region and world." But it's not my petition, so you can sign that one as you like. To add my own two cents. As with everyone, I love the diversity and eclecticity of the Green Dragon. In a perfect world, I wouldn't change a thing. Good pubs are hard to come by. On the other hand, it's possible people are missing the proper mental frame here. I don't know that the choice is between Rogue Green Dragon and Green Dragon. It may well be between Rogue Green Dragon and nothing. No doubt the owners wouldn't be making the deal if they had the cash to keep it as is. So while I will miss the current incarnation, and while I strongly support the effort to keep it as diverse as possible, I also appreciate the possibility that the pub doesn't go away completely. Rogue Buying the Green Dragon? According to reliable and undisclosed sources, Rogue will purchase what is currently the Green Dragon Pub and Bistro. One source says “Apparently papers are to be signed Friday (November 14). Officially no one has been fired but no one is expecting to have a job and they already have new people lined up. They are going to close down the Dragon on Monday for three days which is some kind of legal thing to change over ownership of the business. No employee is promised a job after this week.” Another source reported that Loren “Lolo” Lancaster still remains a 1/3 owner of the establishment, and the brewer and publican is trying to find a means to stop the changeover. It is also unclear whether the switch will even be totally legal. This will mean no more eclectic tap offerings outside of Rogue’s own brands and perhaps a limited guest taps at the location. What started out as one of the best beer bars in Portland will simply become another Rogue location. Rogue was founded by University of Oregon frat brother Jack Joyce and Bob Woodell and another friend Rob Strasser in 1988. Joyce, a former CEO, and supposed Coors drinker, and his comrades currently offer no happy hour at any of their ten locations. Rogue responded, criticizing a few of the details in the post, but not its substance. Consider it a go. Our Northern correspondent Geoff Kaiser had an article in yesterday's Post-Intelligencer wherein he matched faux craft macros against well-known micros of the same style. It's a fascinating read, and I will go ahead and quote liberally from it. First, the set-up. We recently held a blind tasting of craft-style beers and included several beers from the large brewers, as well as beers from more traditional craft brewers. The participants included casual beers drinkers who usually reach for a light lager, as well as typical craft-beer drinkers who enjoy a variety of styles from various brewers. The beers were judged on a 10-point scale. He conducted three flights: Bud's American Ale v. Alaskan Amber; Michelob Pale v. Full Sail Pale; and three wits, Michelob Shock Top, Blue Moon, and New Belgium Mothership Wit. The good news? Micros won. But there's some concern here--except for the Michelob Wit, the macros held their own. Looking at both of these beers in their glasses, it's impossible to tell which is the macro and which is the craft. Overall, the Alaskan Amber came out ahead in the tasting, but not by much [raters scored it a 7/10]. The American Ale held its own with a lightly sweet malt backing and a definite taste of citrus from the dry-hopping process [6/10]. But several tasters thought the sample was "watery" and just too thin for the style. Comment: It's a little surprising they went with Alaskan, which is actually an alt. The Bud is a pretty straightforward American amber, so I would have matched it up against Full Sail Amber or MacTarnahan's. Michelob Pale Ale was released in September, but it was tough to find in the Seattle market. Once again, the A-B product held its own and surprised with an ample hop aroma [5/10]. But there was an overbearing bitter astringency in the taste that several of us noticed. In contrast, the Full Sail Pale Ale [7/10] was more balanced, offering some caramel malts and mild hop flavor without the bitter astringency. Comment: Geoff concludes with this observation: "With so many great pale ales in the Northwest, the Michelob could be a tough sell." Actually, I imagine it's not intended for the Northwest, which is why it was hard to find in Seattle. What's odd is that it was more aggressive than the gentle Full Sail, which I found in a blind tasting to be very similar to other pales (Mirror Pond, Caldera). Maybe the macros should take a page from the Beervana playbook--saleable pales are gentle and Cascade-citrusy. Molson Coors has been brewing Blue Moon Belgian White since 1995 and has been successful in marketing the beer across the U.S. A-B followed suit with Shock Top in 2006 and has a lot of ground to make up. We all agreed the Blue Moon was pleasant and refreshing, but it also was a little bland [6/10]. The Shock Top was disappointing and offered very little character from the wheat [4/10]. One taster noted it was "as bad as Husky football," and another stated, "It tastes closer to lemonade than it does beer." Ouch. Neither of these macro-craft beers lived up to the full, yet still refreshing, taste of the Mothership Wit from well-known craft brewer New Belgium Brewing in Colorado [9/10]. Comment: I'm surprised that Belgian wits have become so popular. Back in the early 90s, I would have considered that a pretty big long-shot. I have always regarded Blue Moon as an adequate version of the style, particularly from a macro. It would have been nice if they had used Hoegaarden instead of Mothership Wit--it's both the standard and easier to find up in these parts. It's a cool experiment, and worth repeating. Report back if you do, will you? Just a couple reminders of events you might want to put on your calendar. I may make the first one, but it turns out I'll be making an excursion to Goldendale, WA during the second. You'll have to buy some of that cherry Adam for me. A limited number of Abyss gift boxes will be available for purchase, which include both the 2007 and 2008 versions and a collectible Abyss t-shirt. You can buy up to six bottles at the event. Cherry Adam From the Wood is the star of this year's anniversary sale, and [brewer Alan] Sprints bought twice as many fresh cherries --- 750 lb. --- for this year's batch, which aged on fresh cherries in bourbon barrels and sherry casks, and was then blended and bottled. And what a beer it is! Dark, aromatic with port and sherry notes and some cherry in the aroma, it's amazingly smooth and round and cherry sweetness is most pronounced in a long, rich finish.... Sprints bottled 120 cases of '08 Cherry Adam From the Wood, and plans to sell 100 of 'em at the dock sale (one case to a customer, please). Dortmunder. This is really just a variant of a pilsner, but so what? Real pilsners are in short supply. Widmer's version was exceptional--crisp but slightly sweet and vivid with Saaz hops. It is half-way between a retro lager like Session and an American pale ale, with the strength and hop vibrancy Americans like. Put this bad boy out in the summer, and I'd buy it by the case. Schwarzbier (aka "blackbier") . This is the second bier the Widmer's already make. In some ways, it fills the same niche of a porter, but it's drier and lighter than most. People have already developed a tasted for dark beers, but few commerical options, and fewer styles, exist. A great Spring beer. 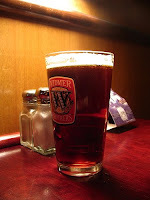 Rauchbier (aka "smoked lager"). Thanks to Rogue and Alaskan, we think of smoke beers as strong, in-your-face beers. But not all the beers of Bamburg (where the style originated) are so aggressive. Some are milder both of body and smoke. I'd suggest something like this, perhaps in the mode of a slightly smoky Oktoberfest, for fall. Kellerbier. 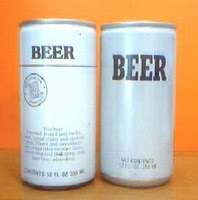 This is really an obscure style, but perhaps would appear the most familiar to American craft beer drinkers. Keller (German for "cellar") is a style of aged bier, usually matured in casks, that is often a higher gravity and IBU than most German beers. A big, burly, tasty beer that would go perfectly with your winter roast beast. So in addition to the Dortmunder, I had the Teaser and an IPA made with an experimental hop known (not quite poetically) as X-114. The Teaser I enjoyed a lot. Since it's made with these new, greenTeamaker hops, I have no previous point of comparison. It would be nice to try a beer with Teamakers in their dried version. It was mellow and gentle--unsurprising for hops with no alpha acids. A bit cookie-like, with a salad-greens freshness. The IPA was all hop, and X-114 is no fading violet. It is boldly citrusy in the lemon/orange continuum. Has cattiness in both the nose and palate, as well asa grassy, herbal quality. Fades to pepper. It is so aggressive that if I were to brew with it, I'd use it with other hops, and perhaps add it to the boil a little later, so it extracted the nice citrus and spice but left some of the grinding behind. 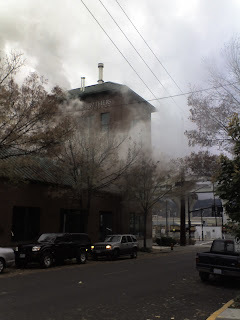 I hastened to Widmer today after hearing about the draft-only bounty, and was greated by cascading clouds of steam, scented magnificently with malt and hops. (I think it was hef, for it smelled wheaty and wholesome.) Man, do I miss that smell wafting over downtown. It was a cloudy day, so the mists sort of comingled beguilingly. Anyhoo, here's a pic. More commentary on Teaser, Dortmunder, and an experimental-hop IPA tomorrow. Back when I was writing about beer for Willamette Week, the Widmer Brothers were demons about calling their product "bier" no matter if it was an alt or an IPA. The intention was to brand themselves as a German brewery, which I think was the goal all along. Events and market realities intervened, and the alt for which they wanted to be famous never sold well (as an early micro, it was too agressive for Weinhard-attuned palates). But times change. DA Beers reports that of the beers currently available at the Gasthaus, four are Teutonic: the Alt (naturally), a Dortmunder, a schwarzbier, and a doppelweizen. It may be coincidence. But for any stray Widmers who may be reading this, consider it a request, too. It's not 1989 anymore, and beer drinkers have come full circle. So many of us blew past the German beers, with their malty subtlety, right to the hop monsters and gravity bombs. But now we're old and calmer and we're finding our ways back. The alt, for example, seems like a sprightly little number that could tastily whet our whistle for a night's session. Schwarzbiers are gaining quick popularity among dark-beer fans who lament the paucity of dark beer styles. And I have yet to meet a single person who does not like doppelbock. Doppelweizens surely are not an apple fallen far from that tree. If you brew it, we will come. This time, anyway. Promise. Well, while I've been a beery laggard, Angelo's been interviewing Upright Brewing's Alex Ganum. I actually got an email recently asking if Upright was still on track, and thanks to Angelo, we have an answer. It's a pretty brief interview, but worth a look. And the coolest thing is the picture of Alex in a Smeirlap t-shirt. Smeirlap!